ARISSA E/S DUO (NUTTY): Matte eyeshadow great for contouring/highlighting as well as for the eyebrows. CREME BLUSH (CHEERY): a browned-down rosy pink blushcreme. MAC MSF (SO CEYLON): a rose/bronze with golden bronze veining Mineralize Skinfinish. MAC STUDIO STICK FOUNDATION (NC 55): medium buildable coverage foundation. Bobbi Brown BRONZER (DEEP): soft matte, silky-smooth bronzer instantly gives skin the look of a natural tan. 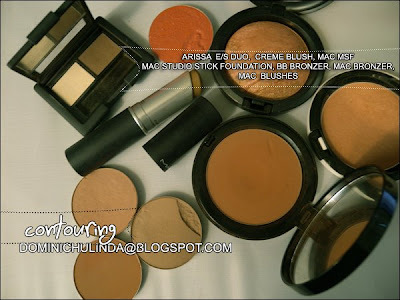 MAC BRONZER (Bronze): Ideal for enhancing a skin tone or to accent or strengthen a tan. Deep golden brown.